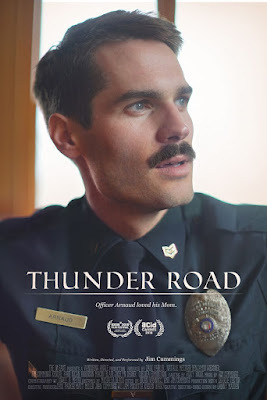 "THUNDER ROAD" will begin a theatrical release October 12 exclusively in Alamo Drafthouse Theaters, including in Virginia (Ashburn, Charlottesville, Winchester), Texas (Austin, Dallas, Houston, Lubbock), New York (Brooklyn, Yonkers), Colorado (Denver), Nebraska (Omaha), North Carolina (Raleigh), California (San Francisco) and Arizona (Phoenix). Showtimes can be found at drafthouse.com/show/thunder-road. Writer, Director and Actor Jim Cummings will be participating in Q&As at select screenings throughout the East Coast. Starting on October 19, the film will expand across the country including showings in Los Angeles, Columbus, New Orleans, South Florida, and Vancouver. 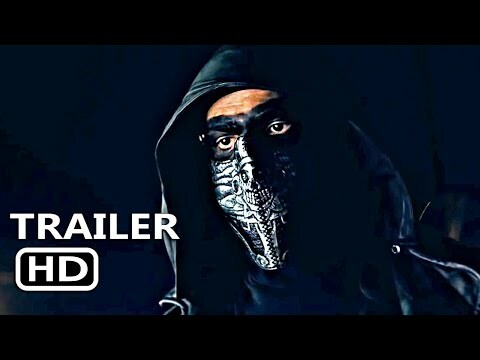 The full list of theaters can be found at the film’s website, thunderroadfeature.com, and will be updated throughout the coming weeks. "THUNDER ROAD" is currently playing its fifth week in France to great success. The film stars Cummings, Kendal Farr, Nican Robinson, Jocelyn DeBoer, and Macon Blair. The film is produced by Natalie Metzger, Zack Parker, and Benjamin Wiessner. It is executive produced by Matt Miller of Vanishing Angle. "THUNDER ROAD" has been a festival favorite both internationally and domestically. The film was honored with the the SXSW 2018 Feature Film Grand Jury Award and was in the top five best reviewed films at Cannes this year where it premiered internationally. The film has also received the Grand Prix at Deauville American Film Festival in France, the New Directors Grand Jury Award at Nashville Film Festival, the New American Cinema Grand Jury Award at Seattle International Film Festival, the Narrative Feature Jury Prize at the Indie Street Film Festival and the Best Feature Award at the Sidewalk Film Festival. Jim has also written and directed the Topic original series STILL LIFE, episodes of which have been Vimeo Staff-Picks, and the Fullscreen original series THE MINUTES COLLECTION, recently featured by FilmStruck and select episodes screened at Sundance and SXSW. "THUNDER ROAD" is being distributed by Vanishing Angle, in association with The 10 East Pictures, and with the support of Sundance Institute’s Creative Distribution Fellowship. Vanishing Angle is an independent studio based in Los Angeles. Previously, VA distributed the successful, 35mm only, theatrical release of Dennis Hauck’s TOO LATE starring Academy Award nominee John Hawkes. Vanishing Angle will also be releasing Patrick Wang’s A BREAD FACTORY PART 1 and A BREAD FACTORY PART 2 on October 26, and Wang’s previous film THE GRIEF OF OTHERS on November 2, in New York and Los Angeles. THE GRIEF OF OTHERS was produced by Cummings, Miller, and Wiessner.